Usually I look forward to a decent full-day hike at the weekends, exploring the peaks and forests of the mountains we’re lucky enough to live in. Enjoying stunning views, taking the mountain air and a cheeky lunch break at a little restaurant with good friends – what’s not to love? There are dangers of course. Trips and falls, being caught in bad weather, getting shot. Wait, getting shot? Rainy days in the mountains are not the grey miserable drizzly affairs they are in the UK. Dramatic low hanging clouds sweep up valleys like tidal waves, rivers turn into swirling gushing torrents and the green forests look almost fluorescent. Instead of going high, it’s best to go low and to make the most of the weather we visited the Gorges de la Diosaz. Starting a hike of 1km vertical ascent up a mountain at 3pm when a storm is forecast might not have seemed like the best idea to some people. 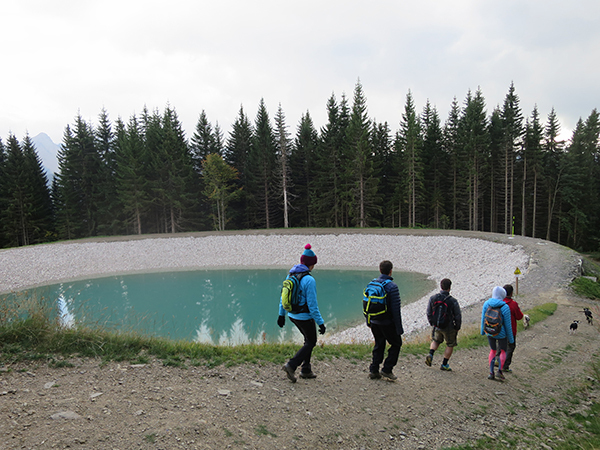 But when we saw the Emosson dam looming above us we just had to get up there to check it out – and I’m so glad we did! We’d driven to Chamonix in the camper van, had some work meetings in the morning and taken the advice of a local client to take a short waterfall hike from the little hamlet of Barberine. We reached the waterfall in 20 minutes and the signs directing us to the 2hr trail to the dam were too much to resist, so on we marched with one eye on the gathering clouds. There’s no better place to be on a sunny day in the mountains than hanging out by a stunning bathing lake – and Lake Montriond, near Morzine, is my favourite. The views over the turquoise lake, surrounded by steep cliffs and green forest, will leave you speechless. And there’s so much to do here it’s the perfect place for anyone to spend a full day. France is a Catholic country with strong links to its past. I love coming across little shrines dotted around medieval walled towns and roadsides – some quaint stone carvings, some amusingly tacky. But in Puy-en-Velay this lovely French tradition is taken to a whole new level. Huge statues and even a church perch precariously on top of volcanic pillars that jut out of the otherwise flat earth like stalagmites. Their looming presence gives the overall effect of being constantly watched over. I wouldn’t like to be a pickpocket here. Ever wondered where skiers disappear to when ski resorts close in May? Like little melting snowflakes they trickle off down the mountain trying to find their way to the sea. 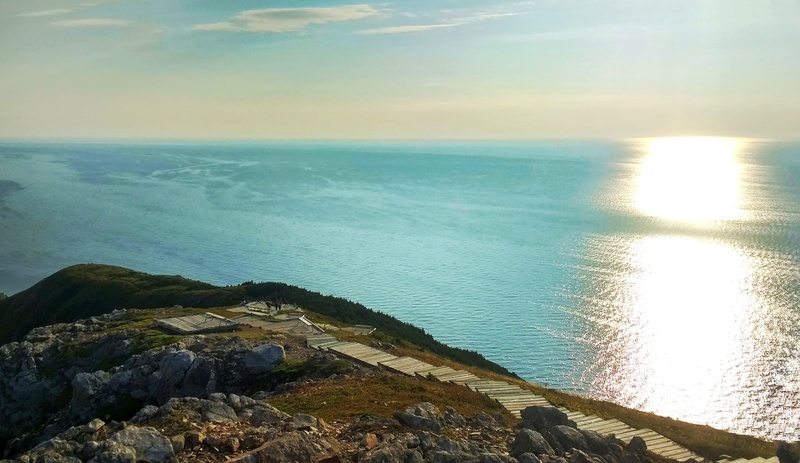 There they trade their skis and snowboards for surf boards, and search out more seasonal jobs as beachside bars and restaurants open for the summer season. Most migrate right the way across to the other side of France and swap winter sports for water sports in Hossegor, Moliets or the stunning coast nearby. An untypically hot weekend forecast for the last May bank holiday tempted us to follow the herd – Moliets is just 2 hours’ drive from Monpazier, where we’d just finished 10 days of intense labour on our holiday rental cottage. We wanted a full weekend of beach picnics and chill. Our rustic hideaway holiday home La Petite Grange has had a makeover! 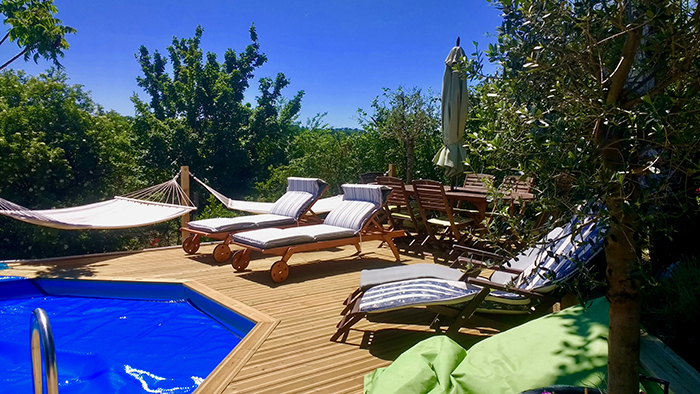 RustiKatie and the team spent 10 days down in Monpazier (Dordogne) replacing and extending the decking – adding a super-chill new hammock area – re-painting the shutters, re-concreting the steps, taming the garden and generally making the place even more awesome. An outdoor fridge next to the BBQ on the porch means you can now keep your beers cold and close at hand while you relax on the comfy chairs looking out at the view over the fields and listening to tunes on the outdoor speakers. Heaven! The pictures say it much better than I can – what do you think?! Life in the mountains is all about exploring and getting out into the great outdoors – which is why we bought a camper van last week! From our home in Morzine we can reach some stunning places within an hour or few’s drive – Annecy, Switzerland, Lake Geneva, Italy’s lakes or coast. We could even just pop up the road to beautiful Lake Montriond with the BBQ and a bag of wine for sunset any day of the week! With just a moment’s notice Steve, the dog and I can hop in the van and be on holiday. We can’t wait! The van has a pop-up roof, a couple of hobs and a sink, electrics and we’ve got plenty of outdoor furniture to play with. So here begins the Downs’ Camper Adventures (nothing to do with Steve’s limp wrists – or my currently broken one). I attended a French Loto event last night. I spent 4 hours at it so I feel I’m well qualified to advise on this. If you’re thinking of going to one – don’t. You might be tempted by the fact that a bingo session is considered a good night out in England. Not necessarily my cup of tea, but my cousin took me to one a couple of years ago in a Working Men’s Club and it was quite hilarious. Plenty of bar breaks, lots of audience interaction, entertaining bingo callers, music, all quite sociable and everyone merrily cheering the winners on. Not so in France.